This post was updated on 5/31/13 at 12:20 to reflect new developments in the situation in Istanbul. Istanbul is facing tough times lately. Gezi Park, a 70-year-old urban park near Taksim Square in the city center, is slotted to be replaced with a shopping mall and residences. The new construction is part of the government’s redevelopment plan for the Square. 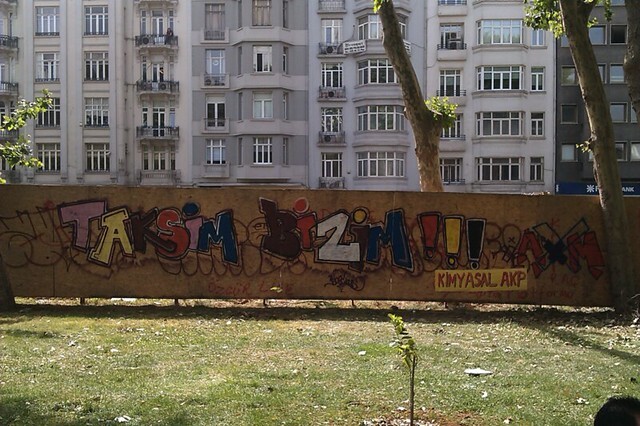 But Gezi Park is the only significant green space in the region, and what Istanbul really needs is more green space. There are many shopping malls already. The government insists on building more. On May 28th, bulldozers came to the park and started to destroy it. A group people have been protesting the destruction since that day. The protesters have been on guard, staying in their tents on the park. Protestors include urban planners, architects, journalists, artists, elected officials, and students. 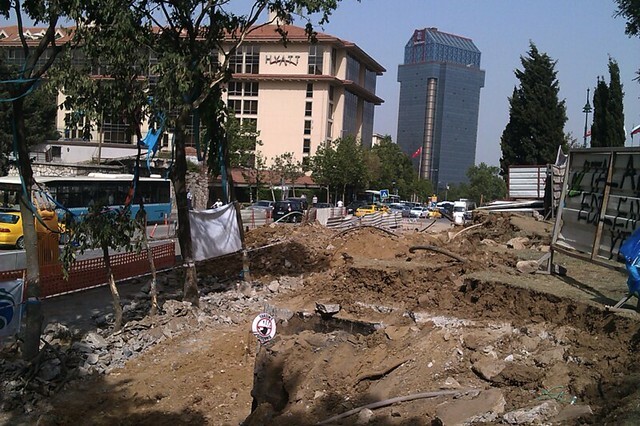 One member of Turkish Parliament, Sırrı Süreyya Önder, prevented the bulldozer by getting in front of it for that day. But the police have been using tear gas and other forceful tactics to disperse the protesters. You can see in this photo that a policeman is using tear gas on a woman standing no more that three feet away from him. This woman is an urban planner. The protesters are calling for more people to come to the park to protest. The bulldozers are trying to dig. In the image above, you can see the ground damaged by attacks. On May 30th at daybreak, the police attacked the protesters again with tear gas, burned their tents, and got them out of the park. Bulldozers, again, got in the park and started to destroy it. But again, the same elected official stood in front of the bulldozer and managed to stop it. The bulldozers went away, but came back at daybreak on the 31st. Today, May 31st, is the 4th day of the protest. The protestors have been on guard since the first day and have increased in number. At 5:00 am today the police tried to clear the protestors. Many people were injured by their attacks. Vehicles that were crossing the area supported protestors by honking. 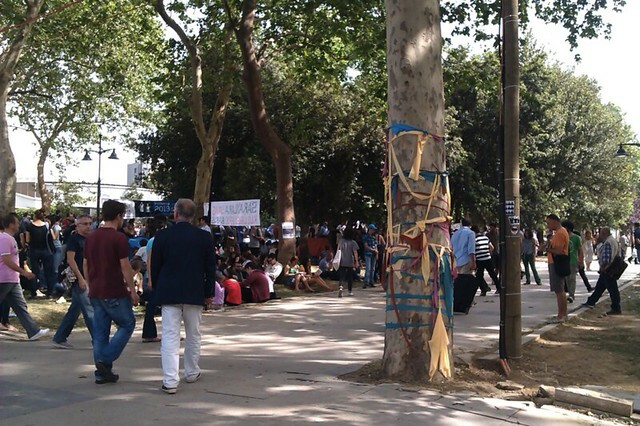 Some NGO’s including Taksim Gezi Park Solidarity Society, as well as deputies and citizens, wanted to make a press statement near the Gezi Park, in front of the Divan Hotel at 1:00pm EEST. But the police, again, started to attack with tear gas while protestors attempted to make their statement. With great difficulty, the protestors took shelter in the hotel. Peaceful protest in the park. 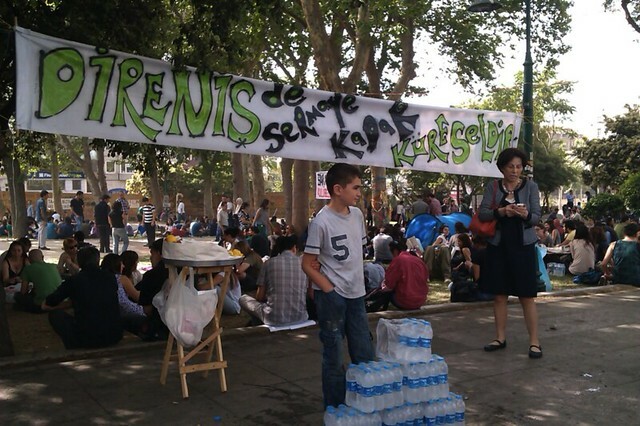 A handmade sign in the center of the park says that “Resist global capitalism.” A little boy sells water. 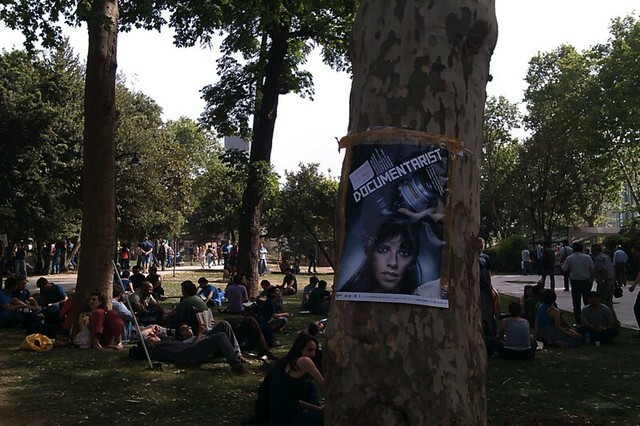 This poster in the photo below is from the Turkish documentary film festival, Documentarist. 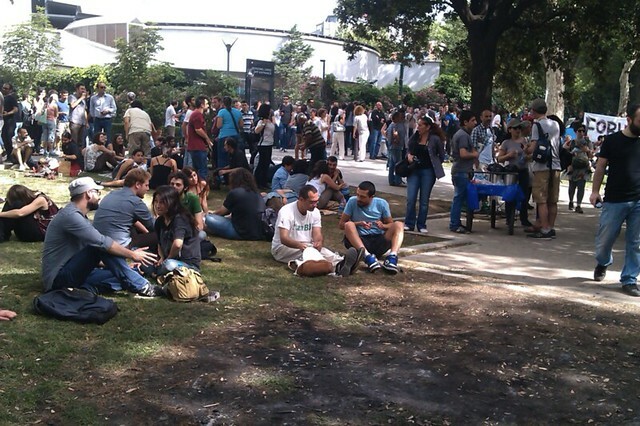 Protestors planned screenings of the festival films in the protest area. By the evening of May 30th, support for the protest increased. There are were more people in the area at that time. In addition to that, food was being provided for the protesters. 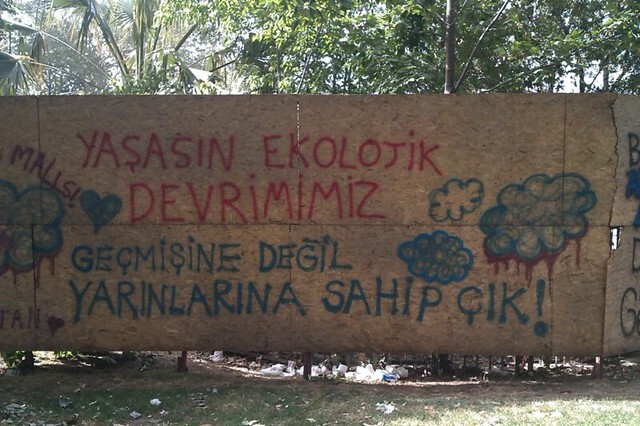 This is a controversy not only for green space, for the park, but also for democracy in Istanbul. The government has no certificate of approval for destruction. The government should not make such decisions without participation of its people. Moreover, there is no mechanism in Turkey through with urban planners can influence the final decisions about cities directly. Post and photos by Elif Yasemin Azaz.